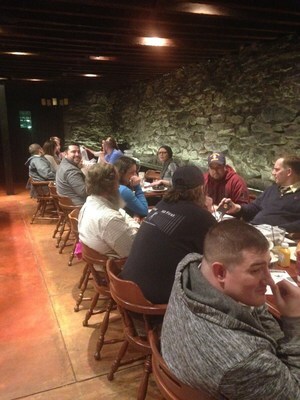 HAGERSTOWN, Md., Jan. 30, 2017 /PRNewswire-USNewswire/ -- Veterans recently connected at a recurring Wounded Warrior Project® (WWP) dinner and trivia event. Participants teamed up, engaged in a good-natured battle, and experienced the benefits of getting out into the community and connecting with fellow service members. "Everyone loves this event because it's laid-back without any awkward pressure," said Army veteran Laura Wilkinson. "I'm a secluded person, but this gets me out of the house. It's nice to be able to reach out for a hand to hold, especially when it's the hand of a fellow warrior." Warriors chatted over dinner and discussed programs offered by WWP and partner organizations. After the meal, the group split into teams and ramped up the competition for the trivia match. "I love the trivia contests and seeing everyone's true military selves come out when the rivalry starts up," said Army veteran John Fiery. "But the best part is the camaraderie." These connection activities support the recovery needs of warriors by reintroducing them to the bonds experienced during military service. In a WWP survey of the injured warriors it serves, more than half of survey respondents (51.7 percent) talked with fellow veterans to address their mental health issues. "It's important for wounded warriors to participate in activities like this – and this is coming from a guy who used to be skeptical about what getting together with other veterans could do," John said. "Being with people who have gone through the challenge of being broken is very cathartic." "Wounded Warrior Project has brought life back into our family – and brought my husband out from a dark time," said Amanda Asaf, whose husband is an Army veteran. "This organization has become a family. They accept my husband for who he is. My husband leaves every event with a smile on his face because he knows he's not fighting his battle alone." WWP staff interacted with attendees, advising them of services to support their recoveries. Thanks to generous donors, WWP programs are offered free of charge and ease the burdens on warriors, caregivers, and families. To learn more about how WWP's programs connect, serve, and empower wounded warriors, visit http://newsroom.woundedwarriorproject.org/.